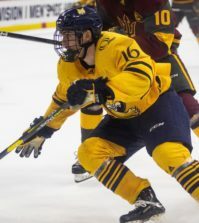 Home > Sports > Men’s ice hockey takes series vs. Ohio St.
Men’s ice hockey takes series vs. Ohio St.
Langlois nets two goals, Peca scores shorthanded as Bobcats defeat Buckeyes, 3-1. Jeremy Langlois scored his second and third goals of the season Saturday afternoon, as No. 20 Quinnipiac defeated Ohio St., 3-1. Forward Matthew Peca also chimed in with a goal of his own, his coming shorthanded. Langlois’ first goal of the night came during the second period. Langlois skated across the offensive zone to the hash marks. Clay Harvey fed the pass, before Langlois wound up and rocketed a slap shot over the left shoulder of Collin Olson for the 1-0 Bobcat lead. 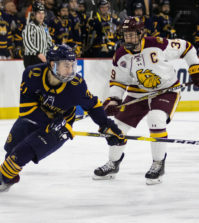 Early in the third period, Peca added insurance to the Quinnipiac (3-1-1) lead during a Zach Tolkinen elbowing major, the latter of which would be killed off successfully. After a scrum ensued on the boards, Peca went for the poke check in attempt to knock the puck away. Peca then picked up his own clear and skated through the offensive wing on a breakaway, before ripping a shot to the left side of the net for the 2-0 Quinnipiac advantage. Yet Ohio St. (1-2-1) would not go down without a fight, and cut the deficit to one at 12:56 in the third. While playing 4-on-4, Max McCormick hit the twine on a shot from the bottom of the circle. Sam Jardine was credited with the assist. Langlois put the game out of reach with 11.3 seconds remaining in regulation, this one coming via the empty net. 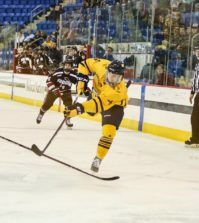 Langlois skated around the circle and fired a shot across the empty crease to seal the Quinnipiac victory. The Bobcats open conference play this Saturday against Colgate at Cape Cod Rink in Hyannis, Mass. Puck drop is set for 7 p.m.